Many thanks to Romano Felmang for providing me with details of his early Phantom work. One of Felmang's covers for the American Adventures series published by Fratelli Spada. 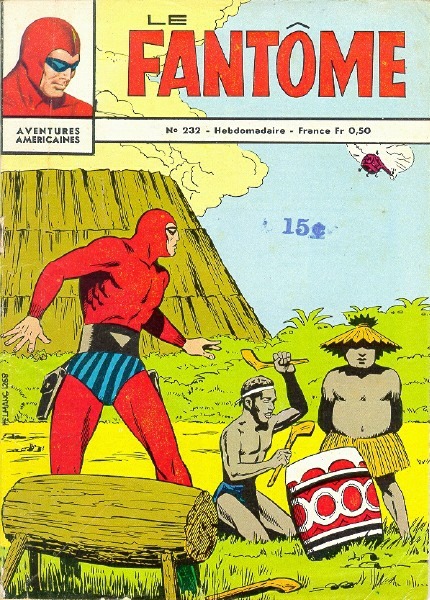 Felmang wrote and drew his first Phantom story, Kaniska , in 1966. The story ran for 8 pages and was never published in it's original form. It did appear in an Italian pocket magazine called Sylvie No.1 (June 1971), and was recently reprinted in Svint Comics . However, the central character was changed from The Phantom to El Diablo . Near the end of 1974, Felmang drew another Phantom story which ran for 30 pages. This story was created for the Italian publisher Fratelli Fabbri, but was never published because the rights could not be obtained. These stories are listed in the order that they were completed, and the working titles are given if they differed from the Frew title. In order for Romano to keep up with his busy schedule, he receives assistance from several different art assistants. It is very difficult to specify exactly who did what in each story, since the roles of layouts, pencils and inking are shared around. The "assistant" credit given in the list below, is based on information provided in the individual comics, and published lists for the Swedish and Norwegian editions. Perhaps the best of Romano's assistants is Germano Ferri, who beautifully illustrated numerous Phantom stories for Fratelli Spada in the 1960s (his first was in the Italian American Adventures #25, published on 9 Dec 1962). "Marineland Drug Menace" was published with English translation in Wolf #1. In story #74, Felmang temporarily changed his pen-name to "Roy Mann". However, he has always preferred to sign his artwork as Felmang, even though Egmont continue to credit him with the name Roy Mann.